Are parrots and cockatiels good pets for children, and should you buy a parrot or cockatiel as a pet for your child? Well, I guess it depends on your child. To determine what type of parrots are good pets for children, you first need to look at whether the bird in question can injure or hurt your child, then you need to look at whether your child will injure or hurt his or her bird. If your child is the rough and tumbles sort, maybe a medium sized dog would be the answer rather than a bird. That way they can play together and get rid of pent-up energy. If your child is a gentle patient type, then a bird is ideal. A cockatiel makes an excellent pet for a child, as it is gentle and friendly. Make sure you supervise your child and teach your child to care for the cockatiel properly first. It is a good idea to buy a hand reared cockatiel for a child, as taming a wild cockatiel is a bit hectic for a child to handle. Make sure that your child isn’t allergic to dust, as cockatiels always have dust in their feathers. A budgie also makes a wonderful pet for a child. They can be tamed quite easily and do not have huge beaks, although they can give a painful nip if provoked. You can read more about Budgies as pets by clicking here. I would not recommend an oversized parrot for any child younger than 12, as they can be dangerous if not handled correctly. The reason that bigger parrots are a little more complicated, is that they tend to bond with adults most of the time, and may get aggressive towards your child and give them a painful bite. 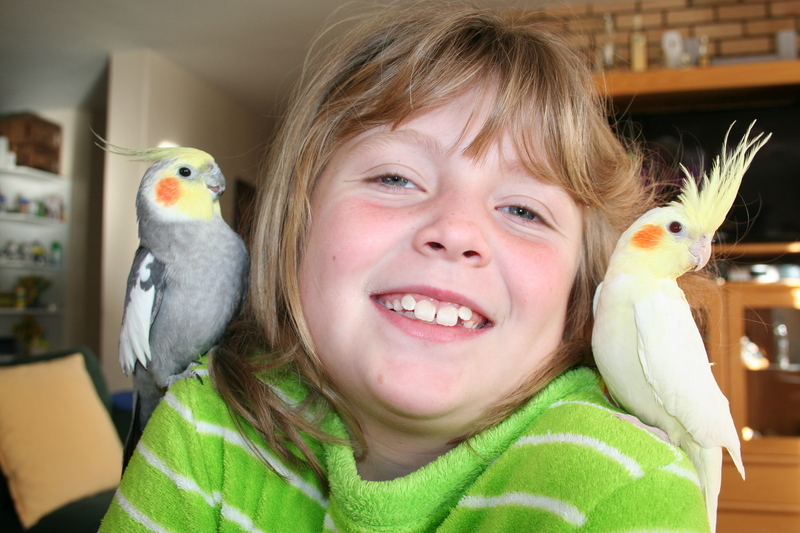 Cockatiels, budgies or other small parrots are a far better choice for your child to start off with. Make sure before you buy your child any pet that he or she knows that the pet will be their sole responsibility, and that includes feeding, cleaning the cage and giving the pet attention each day. Make sure your child approaches the cage quietly. Cockatiels and pet birds don’t like to be surprised. Talk gently and softly to the bird. Cockatiels and pet birds don’t like screaming and yelling. Don’t shake or hit the cage to get the birds attention. Make sure your child handles the bird gently if the bird is removed from the cage. Don’t let your child take the bird outside, as they could get a fright and fly away. If the wings are clipped, supervise your child and pet bird. Respect the bird’s need for quiet time. Don’t give a child a pet as a present. Always make sure it is a well thought through decision, and that the child fully understands the responsibilities of keeping a pet. To read more about other choices that are good pets for children, click here. Are Cockatiels Good Pets Children, Good Pets For Children, Should I give my child a cockatiel?